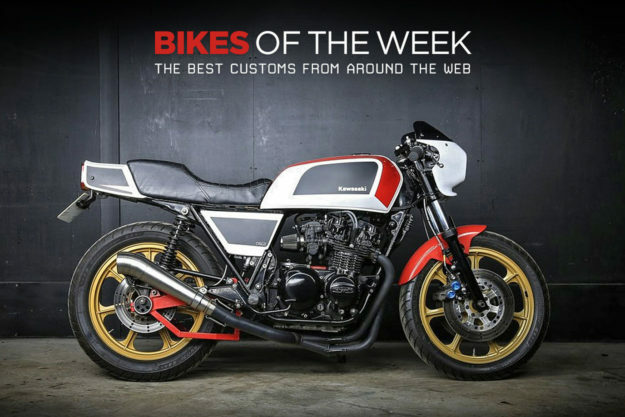 A reborn and retro-fabulous Kawasaki GPz550, an XS750 rocketship built for pro BMXer Kye Forte, the weird and wonderful Windhoff Four Cylinder, and a very sharp custom Kawasaki Z900RS from France. 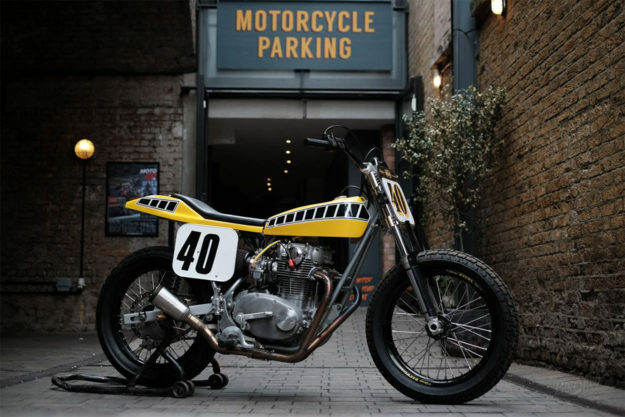 Yamaha XS750 Flat Tracker by Rick Forte Kye Forte’s a pro BMX rider—but when he got his first taste of flat track racing a couple of years ago, he was hooked. 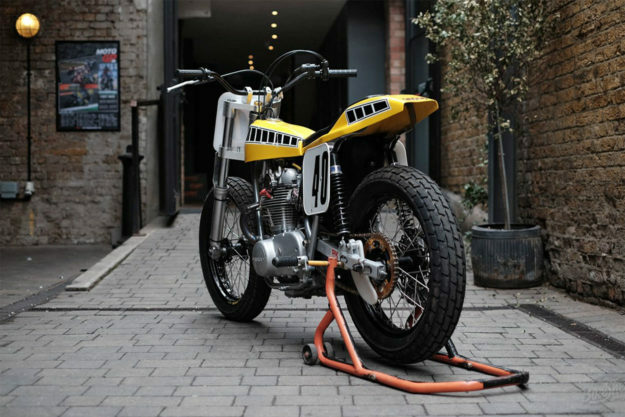 So his father Rick decided to build him a very special race bike: a Yamaha ‘XS750’ Kenny Roberts replica. Rick’s an engineer who tinkers in his spare time, building everything from restos to custom rides. 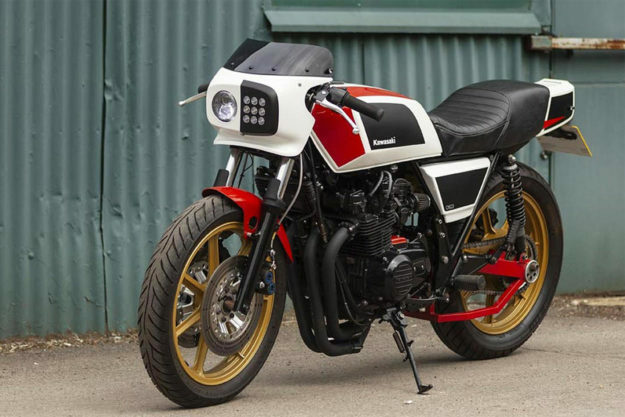 This time he kicked off with an XS650 eBay find, which turned out to be a ton of work. The frame was way too heavy, and the motor not punchy enough. So he started from scratch, hand-building a chromoly frame using a home-made jig. The motor went off to the XS tuners SmedSpeed. It’s been bumped to 750 cc with high-comp Wiseco pistons, a ported and flowed head and a race-spec cam shaft. There’s a modified sump too, along with a hydraulic clutch and a right side shifter—so Kye’s right foot handles both braking and shifting duties. A stubby SuperTrapp exhaust adds an appropriate soundtrack. 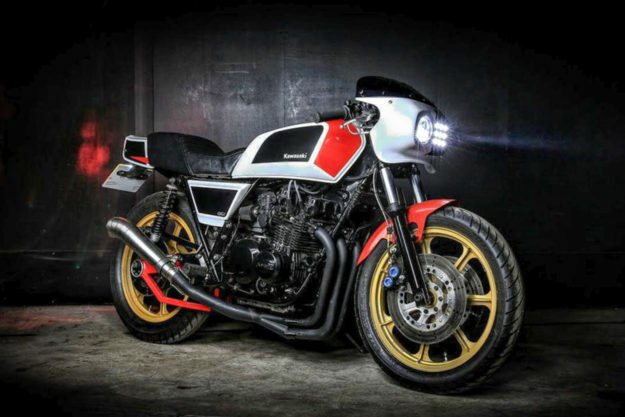 Kawasaki GPz550 by Oil Sweat and Gears This retro-fabulous Kawasaki GPz550 is a story of second chances. The bike was originally a true workhorse; a gift from one friend to another, and regularly loaned out to mates who needed a ride. When it arrived in the Middlesex workshop belonging to Nigel Cripps of Oil, Sweat and Gears, it looked ugly but ran well. The idea was to restore it with a mixed bag of period correct aftermarket parts, one-off touches and some modern bits. Nigel installed a classic Davida swingarm, modifying it to accept the wide rear wheel from a GPz1100. The rear shocks are Hagon, while the front forks and brakes are from a Yamaha Fazer, matched to an 18” Z1300 wheel. The motor has been bored out to 615 cc, and equipped with K&N pod filters and a brand new exhaust system. 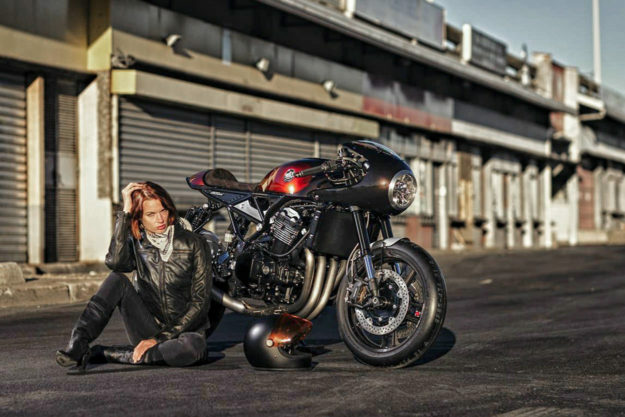 Four-into-one cerakoted Harris headers flow into a Danmoto GP race muffler. Since the bodywork was so shoddy, Nigel massaged a Kawasaki GT550 fuel tank to fit the frame, and edited the stock tail section. He recessed a light into the tail, and swapped out the internals for LEDs. 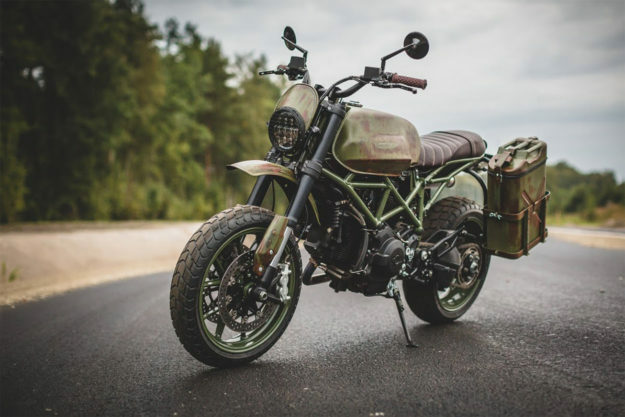 Ducati ‘Hyperscrambler’ by Kalapea Garage When a Ducati-obsessed customer wanted a scrambler for trekking across European trails, Kaspar of Estonia’s Kalapea Garage had something far wilder in mind. 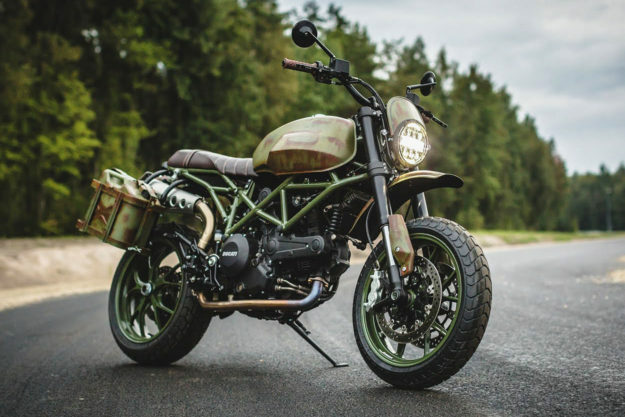 In his shop was a crashed Ducati Hypermotard 796, and he used it to piece together this robust scrambler. Up top is a Moto Guzzi fuel tank, cut-and-widened for a full capacity of 28 liters, and using the stock Ducati fuel pump. A new subframe was built in the same trellis style as the main frame, with modified Suzuki GN fenders at both ends. The client requested that authentic Russian jerrycans be converted to luggage boxes, so Kaspar hopped on a bus to St. Petersburg to pick a few up. They were cut open, given hinges and locks, and lined with gaskets for waterproofing. The luggage rack itself can be unbolted in five minutes. Sorting out a speedo was another mission, since the original dash was wrecked in the crash, and the Ducati’s ECU wouldn’t function without it. So Kaspar installed a programmable Ignitech ECU and an Acewell dash. As an added bonus, he could now remap the bike to compensate for the custom-made airbox system. 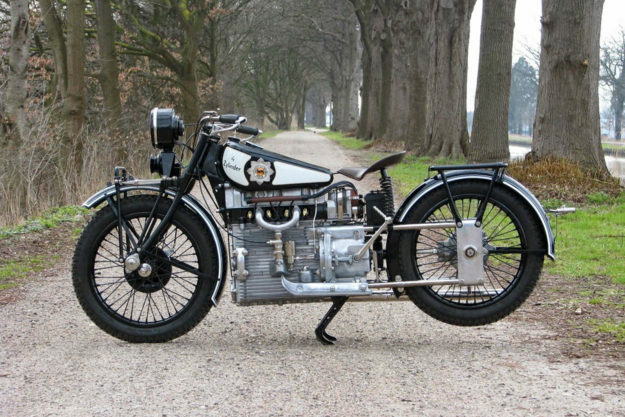 The Windhoff Four Cylinder Our next contender redefines the term ‘big four.’ This is a 1928 model Windhoff Four Cylinder, and it was a big deal at the time: the blockish motor had four cylinders, and acted as part of the frame. It was also oil-cooled, had an overhead camshaft, and the engine block doubled as a radiator. The ‘4 Zylinder’ motor was developed for Windhoff by top engineer Ing. Dauben. Using the engine as the chassis was revolutionary, and the steering head and forks mounted straight to the motor. Out back, the rear wheel mounted to the gearbox via four steel tubes, and was driven by a shaft drive. With the motor putting out 22 hp at 4,000 rpm, top speed was recorded at 80 mph. 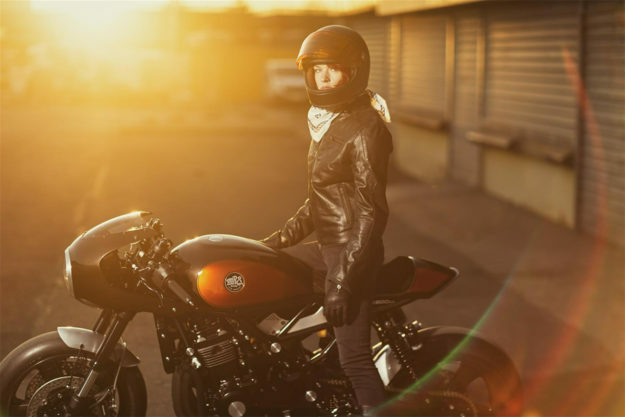 Kawasaki Z900RS by MRS Oficina We wish we had more to say about this bike. But despite it being an ‘official’ project, all we’ve got to work with is three PR shots with a model in the way—and a vague 180-word blurb on the Kawasaki France website. 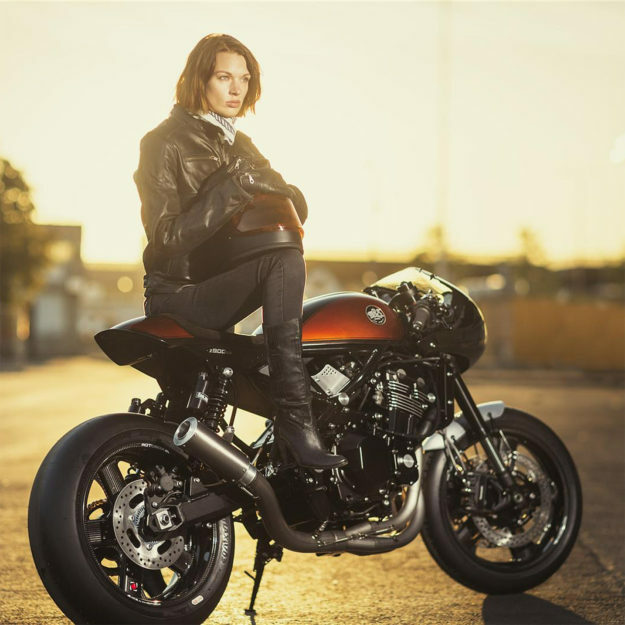 It’s pretty obvious that MRS Oficina has lightened the look of the Z900RS, though—mostly by modifying the rear frame, bobbing the front fender and installing a solo seat and tail unit. The iconic Zed duck tail is gone, but surprisingly, that’s no loss.